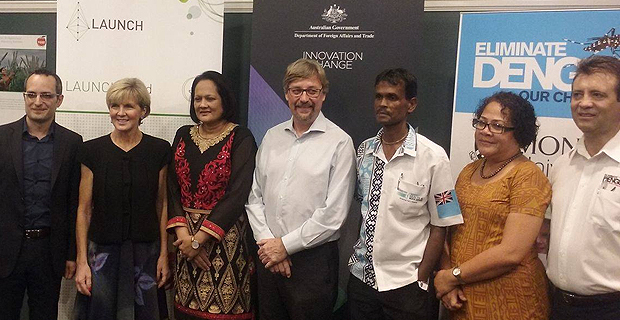 Australia’s Foreign Affairs Minister Julie Bishop (2nd from left) with Health Minister Rosy Akbar (3rd from right) at the launch of the InnovationXChange initiatives. The Australian government has announced that it will be committing more than 10 million Australian dollars to fight mosquito borne disease and obesity in Fiji and the Pacific. It will be committing $7.7 million Australian dollars into a new program to help curb mosquito borne diseases. This program will be piloted in Fiji, Kiribati and Vanuatu. While making the announcement, Australia’s Foreign Affairs Minister Julie Bishop says this is part of their InnovationXChange program and it will introduce various projects that will help reduce or completely eradicate mosquito borne diseases. She says the program was piloted in Cairns, Australia for 6-years and saw a drastic reduction in the number of mosquito borne diseases. The program has been endorsed by the World Health Organization. The program uses a naturally occurring bacteria called “Wolbachia” to protect against harmful mosquito borne diseases such as Dengue, Zika and Chikungunya. Wolbachia will be introduced into local mosquitoes enabling them to block the transmission of these diseases. Bishop has also announced that in order to help minimize issues such as malnutrition and obesity amongst the Pacific Island countries they will commit 4.4 million Australian dollars to pilot programs in Fiji, Vanuatu and Kiribati. Part of this pilot program is a game app which enables children to learn through games, about food and its nutritious values. The game has been piloted in many countries such as Spain and Japan. Another innovation which will be piloted through the program is a Food Switch App. The Food Switch app is included in Google Play Store and enables users to view nutritive contents of the food product that they scan. Users have to scan the bar code of the product and that would help users see through the Food Switch App or search and browse through the product’s details. The app also has traffic light features that have red light like indications for unhealthy choices and green light like indications for healthy choices.